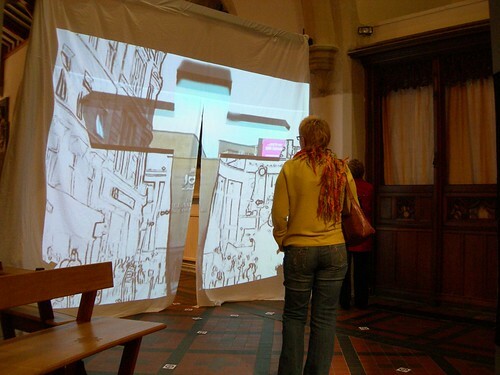 Over on my personal blog I posted about an exhibition I had a video installation in. This is the first time that I’ve done something purely as an art exhibit and not part of a service or event. It was an interesting process to go through to have to let go of a piece and leave it running in the hope that people will ‘get it’. The exhibition was themed on ‘Grace’ and was called ‘Stations of Grace’. The work I put in was created earlier this year for our Good Friday Labyrinth at St Silas. Because of the layout of the labyrinth the approach to the video was controlled and the conditions were ideal for what I was trying to present. However as part of an exhibition where people are viewing different art work in various media and where the approach was different and the projection area smaller I had my doubts over how it would work. Mixing video during an event (live VJing) is vulnerable in one way, but you are in control of what goes up, what works or doesn’t work, you carry the can. However, this was vulnerable in a different way because I had to put the work on – set is up and leave it. The video itself is reasonably simple, a slow motion loop showing street scenes around Glasgow with the outline of a cross (the proportions and orientation of which are taken from Dali’s Christ of St John of the Cross. Inside this outline (through the cross) the image is clear and normal. Outwith the cross only the outlines of the image are shown in a monochrome effect. This in itself works, I think, as the view ‘through the cross’ represents ‘life to the full’ (John 10:10) while outwith the cross it is ‘a poor reflection as in a mirror’ 1 Cor 13:12). However, what makes this an installation is that it is front projected onto a screen with a split in it. Therefore the viewer should be standing between the projector and the screen (this didn’t really work in this installation) by doing so their silhouette appears on the image. Lastly the viewer should pass throug the opening in the screen to move on – therefore going through the cross to move on. Again, this didn’t always work in the exhibition becuase some people went around which is a much more natural thing to do. As an installation it seems to have been well received, it fitted the theme of the exhibition well and was very different from the other works presented which were mostly paintings. I’m glad I got involved because this piece had the interactive and there for ‘installation’ element. Most of the videos I create don’t have that extra dimension to them so I’m not sure whether I would be involved in something like this again. Is it art if you just have a video looping?